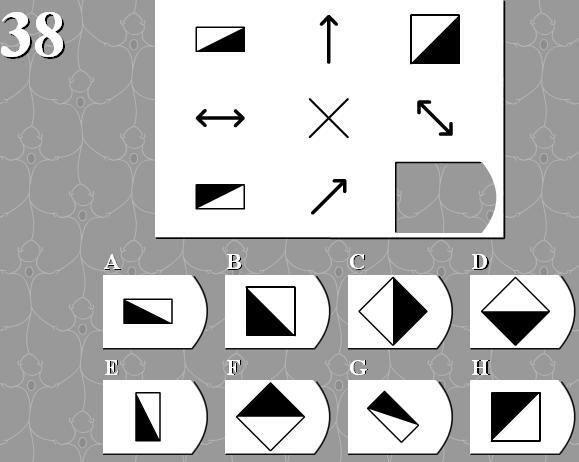 What is correct answer for this IQ task and why? If I answer 1-10 questions correctly and 38 H, I get IQ 92. If I answer 1-10 questions correctly and 38 F, I get IQ 93. So I conclude that correct answer is F.
In the corners (cells: 11,13,31,33) we have some objects. In the middle edges (12,21,23,32) we have operators on neighbouring two objects. The centre cell (22) is simply do not used here [this opinion agrees with tasks 4 and 9 at the same test, where it is used similarly]. Let's look on (12) operator (one arrow), it leads to simple vertical stretching of object. Let's look on (21) operator (two arrows), it leads to simple swap of object colours. Now we are looking on (23) and (32). (23), by our assumption, should swap colours of (13), creating the object from varian H, plus some additional operation, since (23) is different from (13). (32), by our assumption, should stretch (31), making variant H from it, plus some additional operation. What are these additional operations? Since they make the same object from the same object (H) that must be the same. Looking on possible answers we see that all differences between objects are: size, swap of the colours, angle. We have notations for first two differences, so additional operation should be rotation. We see that (23) is rotated respectively to (21), by 45 degree clockwise. (32) is rotated respectively to (12) by 45 degree clockwise. So most probably both additional operations means rotation by 45 degree clockwise. This means that the right variant for (33) is F.
One arrow and two arrows means completely different things. It is counter intuitive. And though double arrow associated with swap, no doubts, it is also associated with stretching. I hope, someone else will find even better explanation, without mentioned two drawbacks. In the absence of any obvious common rule for all symbols, I conclude that each set follows its own rules. Thus the answer is H (column 3 = tall, row 3 = top left half black). I did wonder if the arrows represented transformations for the squares on either side - the arrow in row 1 column 2 could represent a height increase. 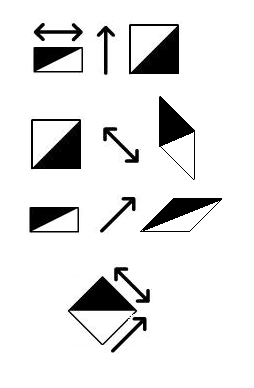 The double headed arrows suggest a flip to me but would have to represent a rotation for this to work. But this system breaks down with row 3 column 2 - there are no answers which have been stretched along a diagonal (which would give a parallelogram). Resulting in a color-inverted square. The arrows and $\times$ are just distractions. Though I get it slightly differently. I got this answer before looking at the other answers, just in an attempt to solve it myself. The first thing I noticed is that the arrows are different lengths. The exact length of the arrow is also the exact size of the shape it is referring to. For example, the one at the top stretches the box to exactly that length. I also came to the conclusion that a double arrow means to flip colors. I realized that the [2,1] arrow did not change the size of the box only the colors, this does not mean that the double arrow ONLY changes colors though, it just means it ALSO changes colors. The arrow length is the exact size as the box in [1,1] and in [3,1], which means the size didn't need to change from that arrow. However, since the box at [3,1] stayed the same size we can assume that the arrow at [2,1] only effects the horizontal lines (aka the top and the bottom lines). The arrow at [1,2] only effects the vertical lines (aka the lines on the size of the box). Using this logic of it decided the exact length of the box based on arrows, and that the arrows at [1,2] and [3,2] are effecting the side walls and the arrows as [2,1] and [2,3] are effecting the top and bottom sides. We can assume right away it must be a diamond shape, since that is the length of the arrows and how they are shaped. After that I just simply replaced the bottom and top of the box at [1,3] with the length of lines from [2,3], then fliped the colors. Then we combined that with the sides of the box of [3,1] being replaced with the arrows from [3,2] and when we combine we indeed get F.
You can see that if you combine those 2 pictures together that is what you end up with. The most important part I saw that was overlooked was that the arrows were always the exact length and direction of the side of the box that was being effected. This is how I came to the conclusion of the answer for this question.